Go to the NAJGA web site for more information on the conference, speakers, workshops, hands-on training sessions, and tours. 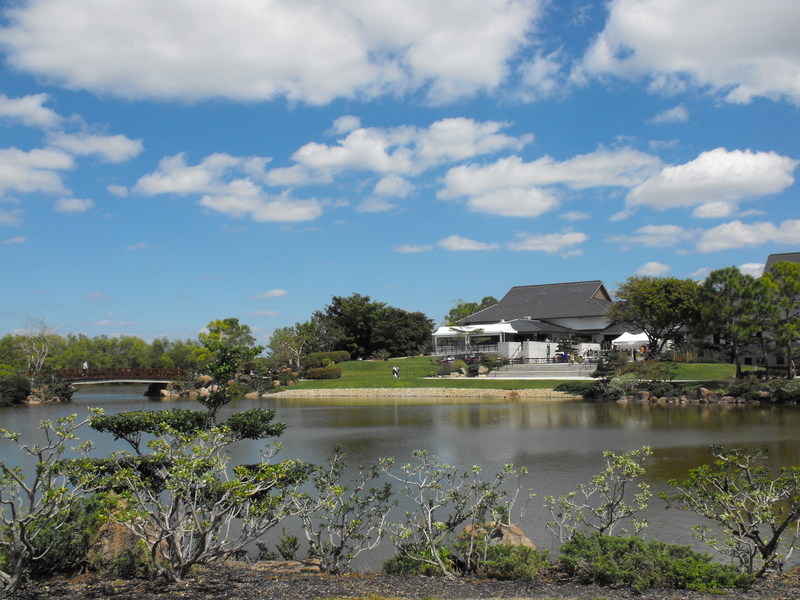 The second biennial conference of the North American Japanese Garden Association (NAJGA) will be held October 16-18, 2014, at the Chicago Botanic Garden. Hoichi Kurisu will be the keynote speaker at the second biennial conference of the North American Japanese Garden Association. He will also offer workshops during the three-day conference. 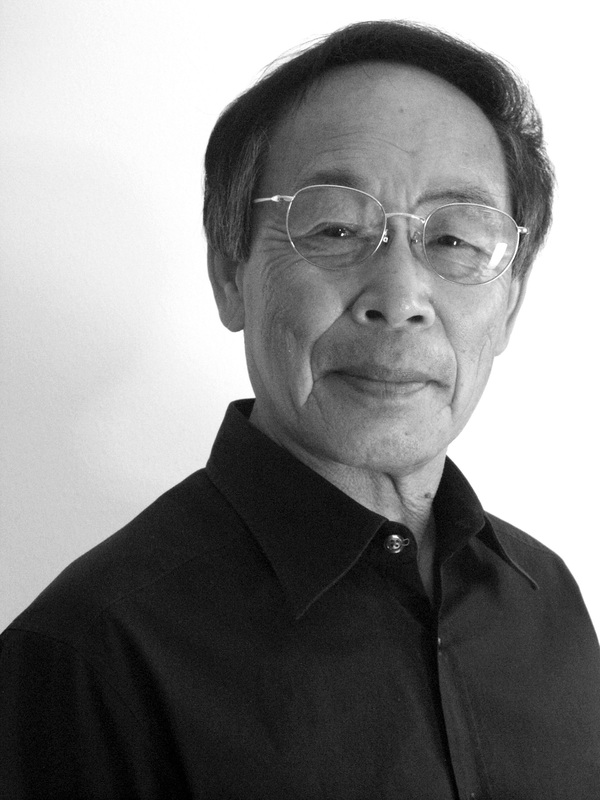 Keynote speaker is Hoichi Kurisu who studied landscape design and construction under Kenzo Ogata in Tokyo, Japan. 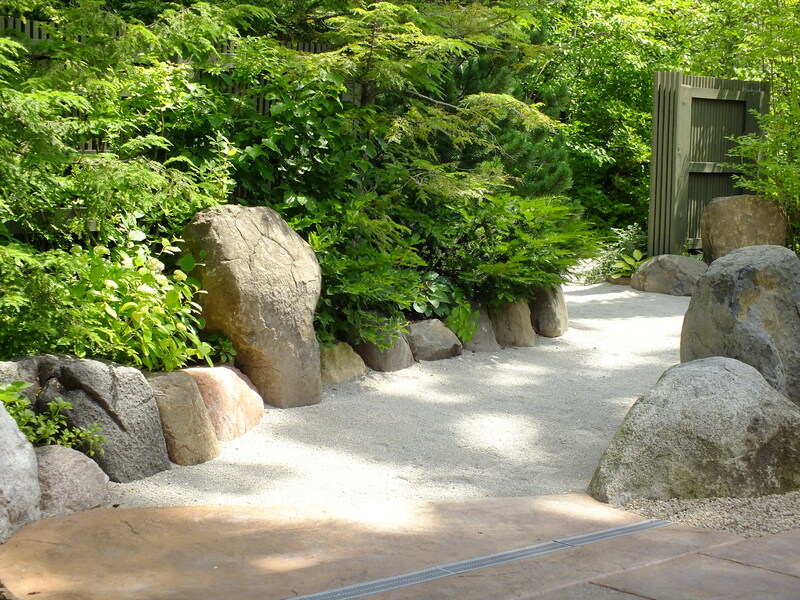 Kurisu was appointed Landscape Director for the Garden Society of Japan (Nihon Teien Kyokai 1968–1972), during which time he supervised construction of the Portland Japanese Garden. In 1972 he founded Kurisu International, Inc., which has since designed and built a number of gardens including the Anderson Japanese Gardens in Rockford, Illinois, Roji-en Japanese Garden at the Morikami Museum and Japanese Gardens in Delray Beach, Florida, the Japanese garden at the Dubuque Arboretum and Botanical Gardens in Iowa, and the a Japanese garden for Samaritan Lebanon Community Hospital, in Lebanon, Oregon, which was the winner of a 2006 Healthcare Environment Award for Landscape Design. Kurisu firmly believes that encounters with nature are essential to mental, physical, and spiritual equilibrium. Each of his designs addresses a unique social purpose and reinforces the quality of humanity. 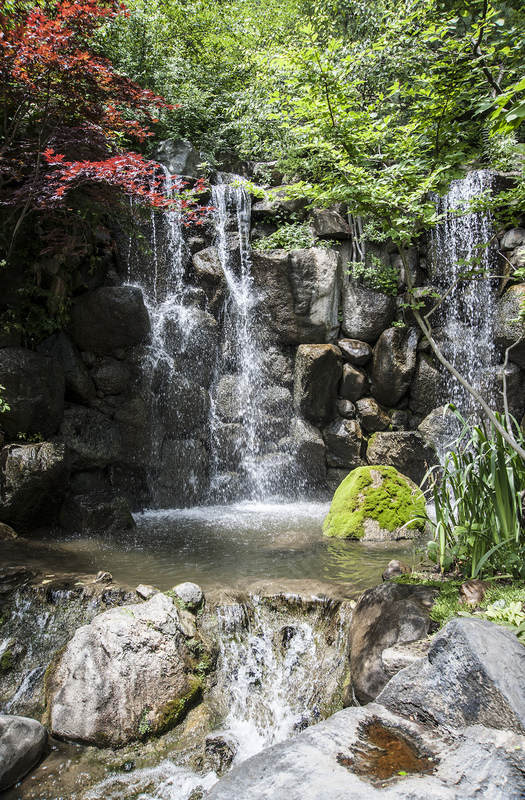 By harmonizing light and shade, water and rock, and space with the senses, the Japanese gardens of Hoichi Kurisu restore peace of mind, physical health, and strong and compassionate communities. 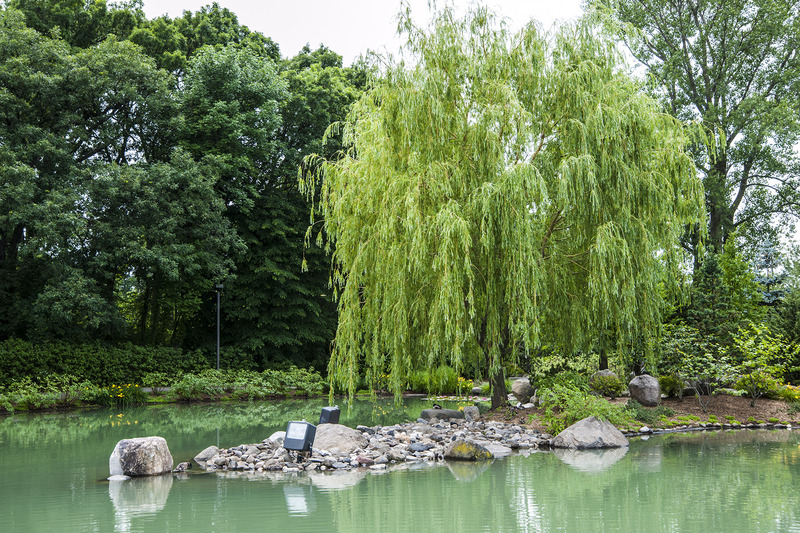 His firm presently is at work constructing a new nine-acre Japanese garden in Grand Rapids, Michigan, at the Frederik Meijer Sculpture Garden. 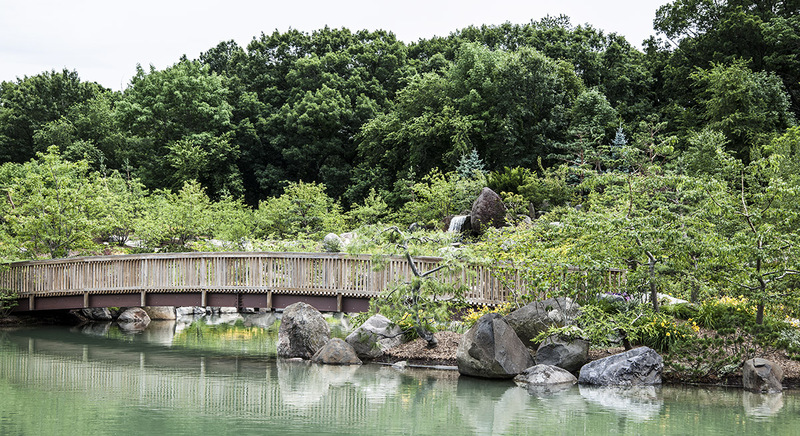 The Richard and Helen DeVos Japanese Garden is scheduled to open in June 2015. An extensive list of workshops covers the basic tracks of horticulture, business culture and human culture with topics such as: Keeping koi healthy, Updating traditional light in the Japanese garden, the new civic garden movement in Japan, Planning for long-term maintenance and renewal, Art of the thatched roof for Japanese garden structures, Art of bamboo, Significance of sukiya style in the Japanese garden, Frank Lloyd Wright and the influence of Japan, Archaeology of the Japanese gardens at Manzanar, Tea in the garden, The Adachi Museum’s operational philosophy, and Using technology to enhance the visitor experience, among other offerings. The conference also offers pre- and post- conference extended sessions and tours. “We all need a place where we can get away from the hustle and stress of life, a place of peace and tranquility. When we find that place, we find strength. The Rosecrance Serenity Garden is such a place. These gardens are meant to be a part of the healing process offered by this incredible facility where miracles happen,” stated John Anderson, philanthropist. 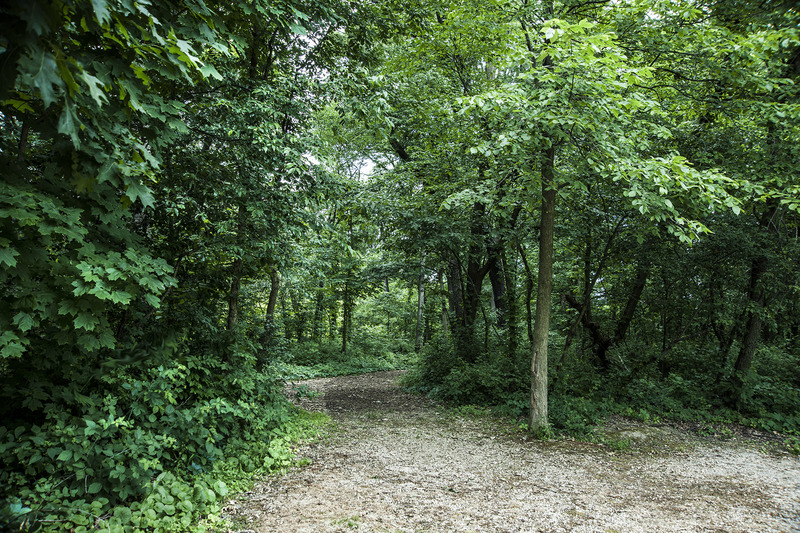 Serenity Garden is located on the grounds of the Rosecrance Griffin Williamson Campus, an adolescent treatment center in Rockford, Illinois. 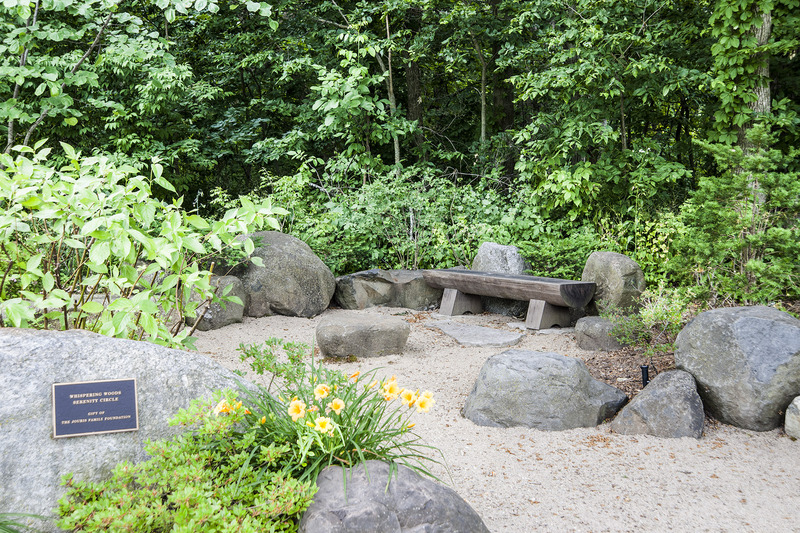 The new 50 acre campus, which opened in 2004, includes this six acre garden designed by Hoichi Kurisu to provide a healing environment to nourish ongoing recovery for youth and their families. Through the Experiential Therapies Department, the garden is used for guided meditation to help adolescents relax and reflect on recovery. Every week, the young people become aware of their basic senses: sight, sound, taste, touch and smell. It is the setting for family visits, individual counseling, private journaling and other contemplative activities. The overall objective of horticultural therapy is to cultivate physical and emotional stability and spiritual awareness through nature in a structured environment. 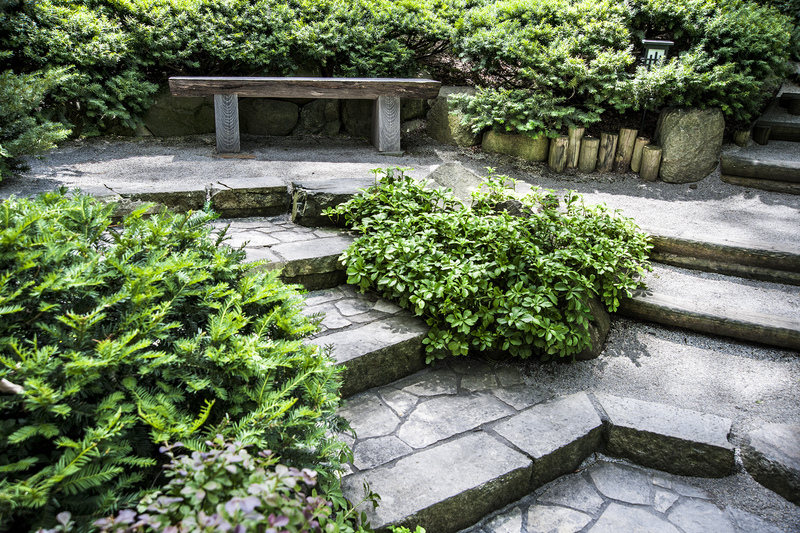 “This garden is designed around the healing qualities of a Japanese garden integrated with the 12 steps of recovery,” said Christine Nicholson, Experiential Therapies Supervisor. “Each week we deal meditation techniques designed to teach our young people how to be at peace with the calm and ‘boredom’ known as serenity. “One week I might ask them ‘What kind of water are you?’ which always gets them going. Raindrop, waterfall, ocean wave – it’s a way to get them thinking about the world outside their heads,” Nicholson said. Being in a garden with streams, waterfalls and a large pond offers several examples as well as an abundance of locations for group and solitary activities. 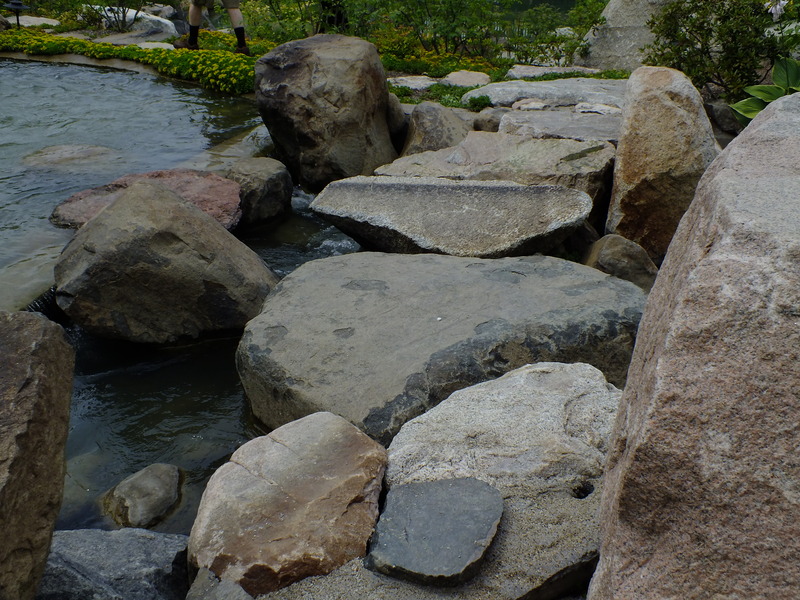 Kurisu describes boulders as the garden’s bone structure and water as the lifeblood running through it. “As you stand on the deck, you view the action of the waterfall. 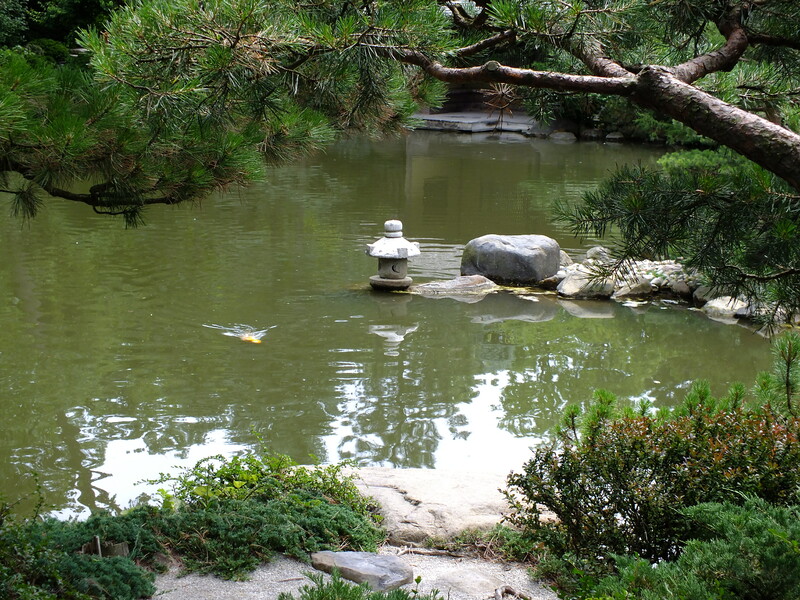 We watch it come down to the calm surface and feel the serenity of the pond. It reminds us that we are never alone in the universe,” said Kurisu. “Another week, I may say, ‘You are the earth. How do people walk on you? As the earth, how do you give to people,” Nicholson said. “Life’s Waiting” carved in stone at the base of the bell tower is the motto of Rosecrance. 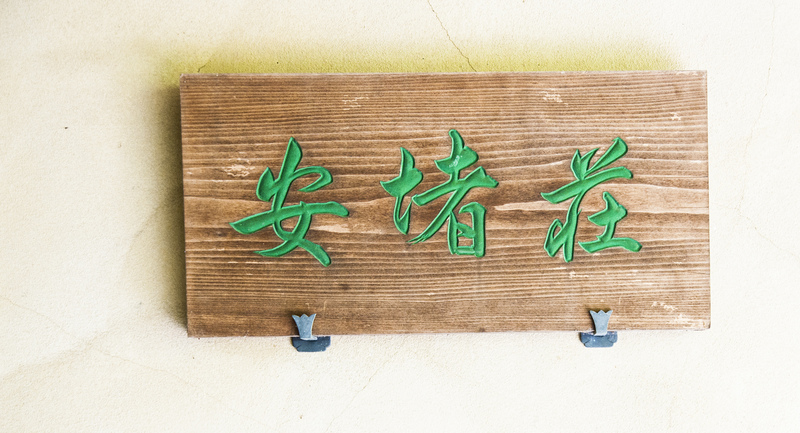 A graduation ceremony involves ringing the bell in recognition of the ancient tradition of seeking purification within a sacred place and the desire for a balanced life. A new element of crossing the bridge will be added to graduation ceremonies, according to Nicholson. 1. 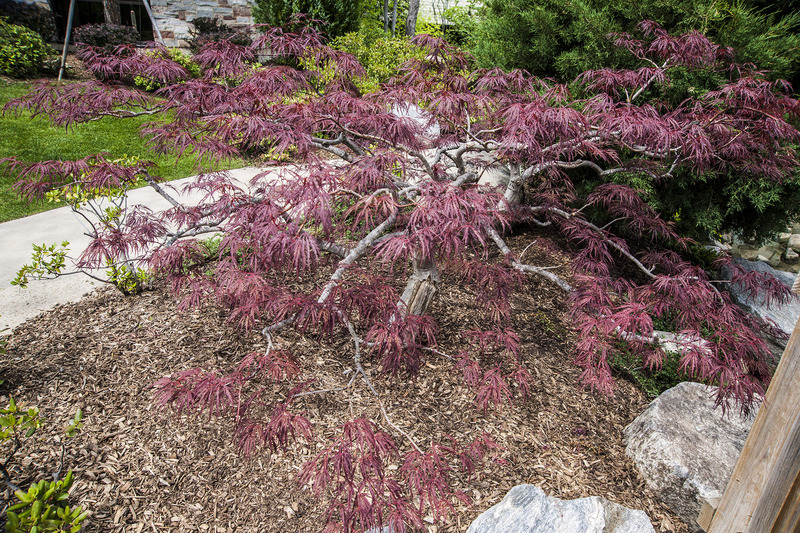 Wooden bridge: this is where an Acer palmatum dissectum adds a splash of red to an otherwise green palette. 2. Courtyard and serenity circle: Serenity circles are places where residents, families and visitors can pause to reflect and view the garden. This is the largest and most formal of the serenity circles. The stream running through the courtyard makes 12 drops (for the 12 Step Program) before reaching the pond. 3. Winding walk: Curves in the path remind users that the journey is not straight and life reveals itself slowly. At the peak of the walk is Peaceful Passage Serenity Circle. 4. The pond: The pond, which is 13’ deep at the center, is supplied with both rain and city water. Koi, bluegill and bass thrive in the pond. From the landing, you can take in the full scope of the pond, formal garden, mountain waterfall and natural forest backdrop. 5. Bell tower: When an adolescent successfully completes treatment, the bell is struck as an announcement to the community. 6. Serenity bridge: This bridge is pitched like a mountain because one must work to get to a better place. The use of cedar, an aromatic wood, engages another one of the senses. Similar to the flagstone bridge mentioned in #7, this bridge is in the #2 courtyard. 7. 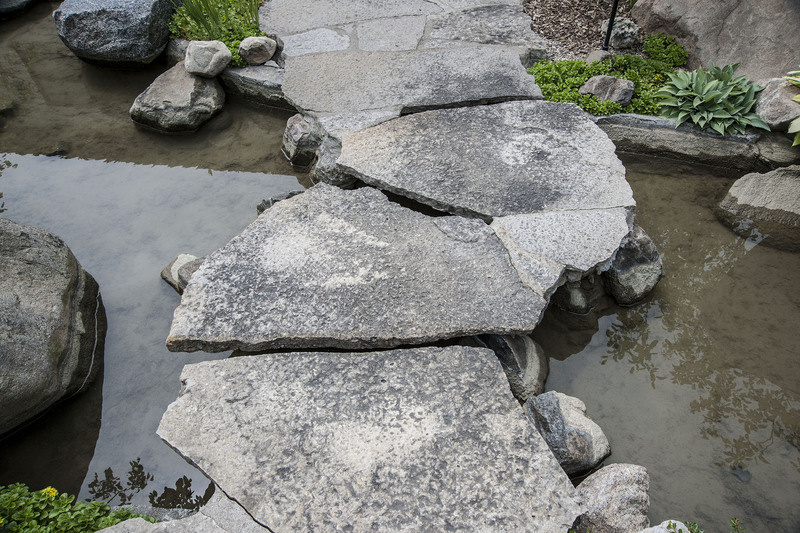 Open stone bridge: The flagstone walkway over the river is deceptive to the eye, giving the appearance of being fragile, but holding great strength. 8. Stepping Stone bridges: At the top and bottom of the waterfall, a stepping stone bridge invites you to cross the flowing water safely. This fall also makes 12 drops before a final plunge into the pond. 9. 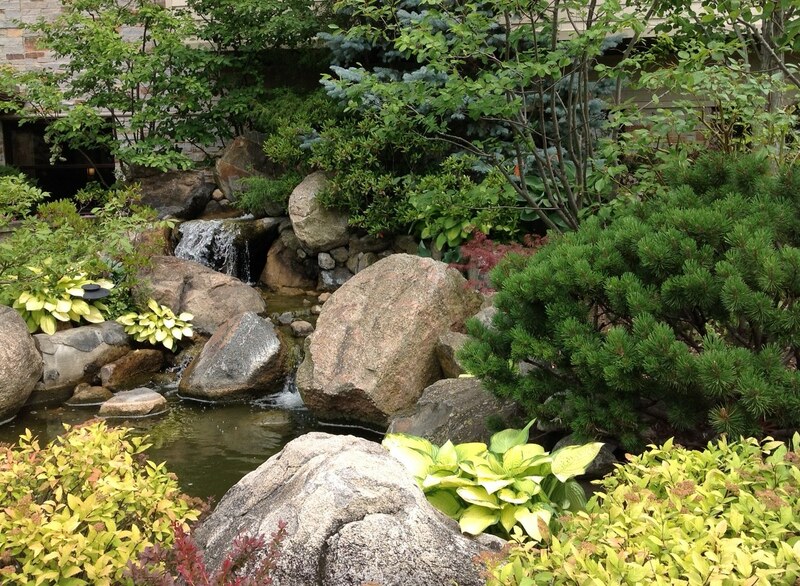 Cascading waterfall: In the style of a Japanese garden, water in our Healing Garden flows only in a way that is totally natural. Anchored by a 40-ton boulder, the large waterfall moves more than 1,200 gallons of water per minute. The falling water strikes the stones in three locations, adding depth of sound. A “guardian stone,” the protector of the garden, juts out of the pool at the waterfall’s base. 10. Grateful outlook: The highest point of the garden represents the top of the mountain. To observe the natural woods beyond the garden, you must look through the evergreen trees, which form a natural frame for the scene. Note how the sound of the waterfall is muffled by the stones. 11. The peninsula: The peninsula is a reminder of the island nation of Japan where water and land intertwine. 12. Cobblestone bridge: Water from the winding river flows under the bridge to the tranquil pond. 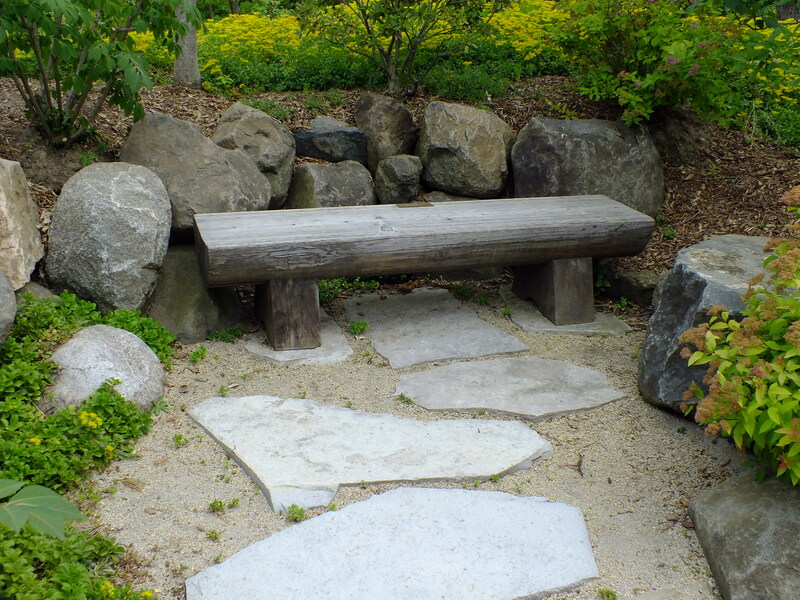 “A healing garden is a natural space that has a therapeutic effect on those who are open to the experience. In a healing or serenity garden there is a deliberate acknowledgement that not all healing is the result of medicine or treatment. Sometimes it comes from unexpected places such as through a connection to the natural world. The elements of the garden engage all of our senses. They offer a positive distraction to everyday life, encourage interaction and provide a connection with nature’s rhythms.” From Rosecrance Serenity Garden overview. Dr. and Mrs. James Rosecrance left provisions in 1916 for their homestead to become an orphanage for boys. Today, Rosecrance provides help, hope and recovery to families who struggle with alcohol and other drug addictions. Photos not otherwise credited in this blog are by K.T. Cannon-Eger. Click on any image for a full size view. Rosecrance is a smoke-free campus. This private garden generally is open 8 a.m. to 8 p.m. on weekdays, 8 a.m. to 4:30 p.m. on weekends. 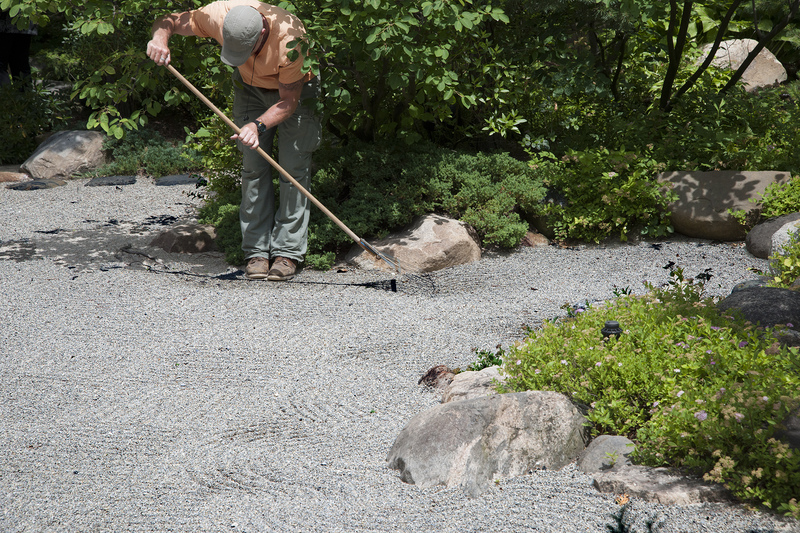 The crunch of gravel underfoot, the plash of water in the distance, the interplay of textures all are part of experiencing Anderson Japanese Gardens. The World’s Industrial and Cotton Centennial Exposition that opened in New Orleans December 16, 1884, introduced author Lafcadio Hearn to Japanese culture. He was so smitten that he moved to Japan, taught and married there eventually becoming a citizen of Japan. This kind of love story gets repeated countless times right up to our modern era, but not always with the same ending. 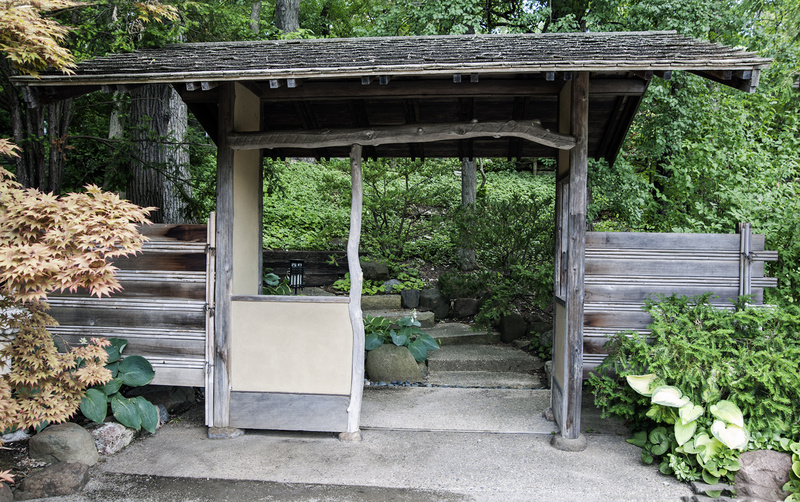 In 1966 after graduating from the University of Wisconsin John R. Anderson visited a friend of his father’s Mr. Akira Ohno, a trip that began Anderson’s life-long appreciation for Japanese gardens. In 1978, on a business trip to Portland, Oregon, he visited and admired the Japanese garden there. He asked the name of the designer, and was told Hoichi Kurisu. 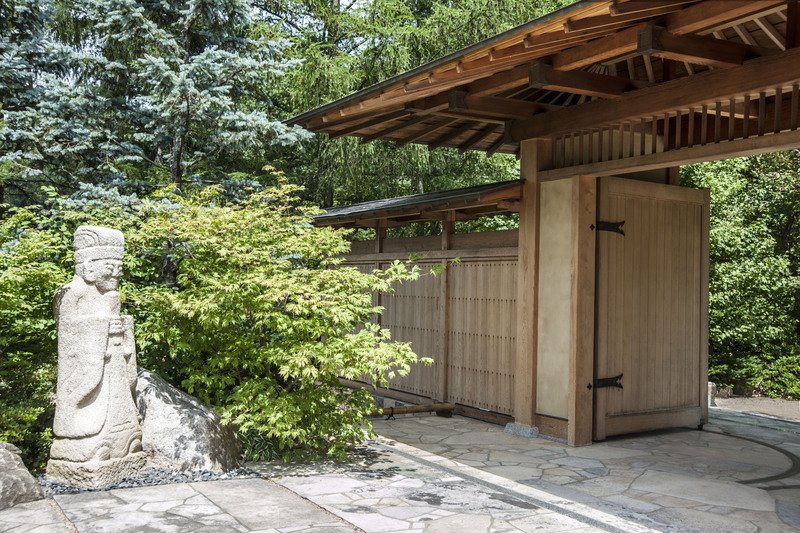 By the fall of 1978, Kurisu was at work constructing a Japanese garden at the Anderson home, a new residence for him and wife Linda and their growing family in Rockford, Illinois. Over time, the garden expanded to its present 14 acres. In 1998, Mr. and Mrs. Anderson donated the gardens to a nonprofit organization. In 1992, John Anderson was recognized for his outstanding work in promoting international friendship and mutual understanding between the United States and Japan with a commemorative silver cup from the Japanese government. In 2012 the Emperor of Japan bestowed The Order of the Rising Sun with Gold and Silver Rays on Anderson. 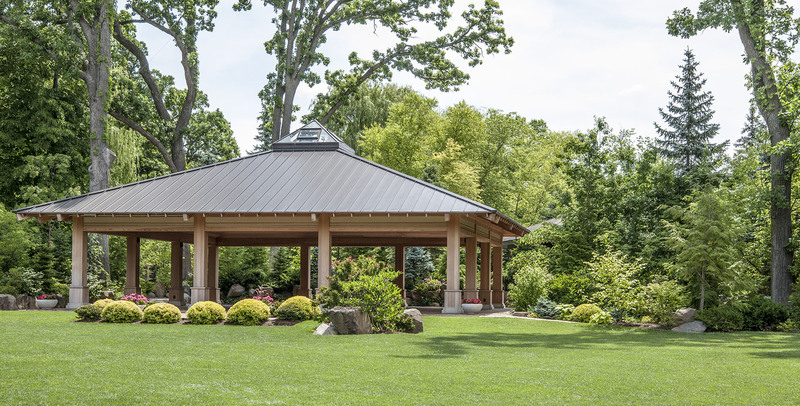 Educational programs at the Anderson Gardens cover the language, arts, and culture of Japan, and since 1995, the gardens have hosted Rockford’s Annual Festival Celebration of Japanese Arts, which includes formal tea ceremonies, ikebana and calligraphy demonstrations, and bonsai displays. A display of tokonoma scrolls is planned for August 23-25. A selection from the Anderson collection of tokonoma scrolls will be on display August 23-25. 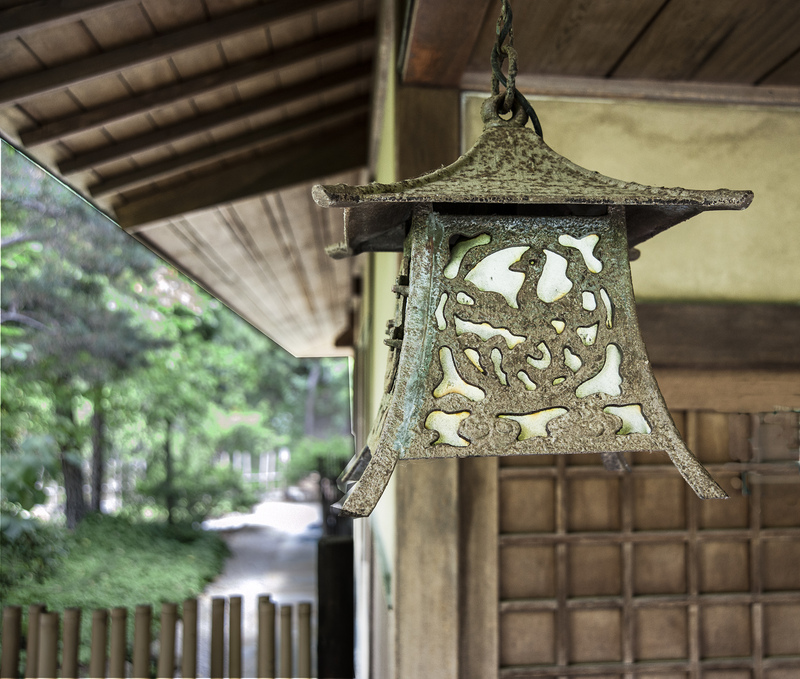 Hoichi Kurisu is the designer responsible for the beauty found at Anderson Japanese Gardens. 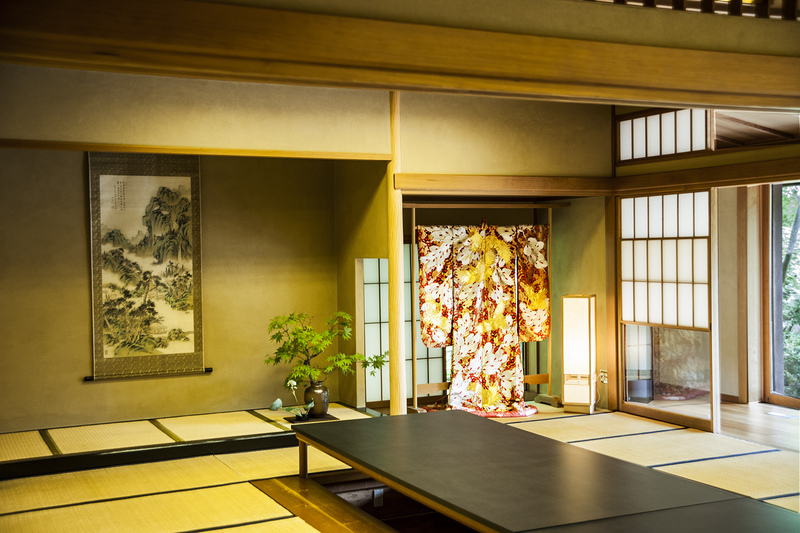 Kurisu graduated from Tokyo’s Waseda University and spent many years in Tokyo, Japan studying under Mr. Kenzo Ogata, one of Japan’s renowned landscape designers. Kurisu came to the United States in 1968 to accept the position of Director of Landscaping at the Japanese garden complex in Washington Park Gardens, Portland, Oregon. He was the second of nine trained gardeners to work at Portland carrying out the designs of Professor Takuma Tono. In 1972 he founded Kurisu International, Inc. with offices in Oregon and Florida. Other major projects include Roji-en, the George and Harriet Cornell Japanese Garden at the Morikami Museum in Delray Beach, Florida; Lebanon Community Hospital in Oregon; and Serenity Gardens at Rosecrance in Rockford. For more on Hoichi Kurisu, view his web site at http://www.kurisu.com/ and be sure to check out the portfolio of completed work and videos of work in progress. 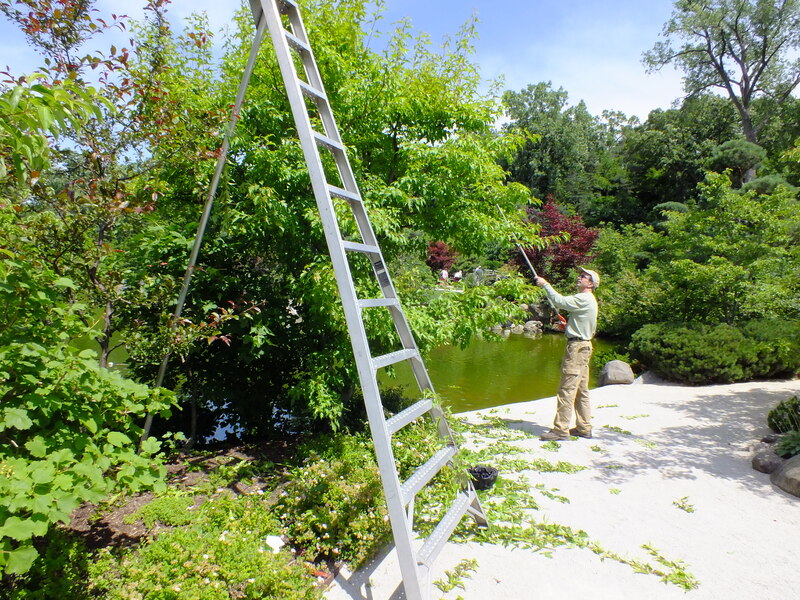 Kurisu continues to this day to ensure continuous improvement of the grounds and design of Anderson Japanese Gardens. 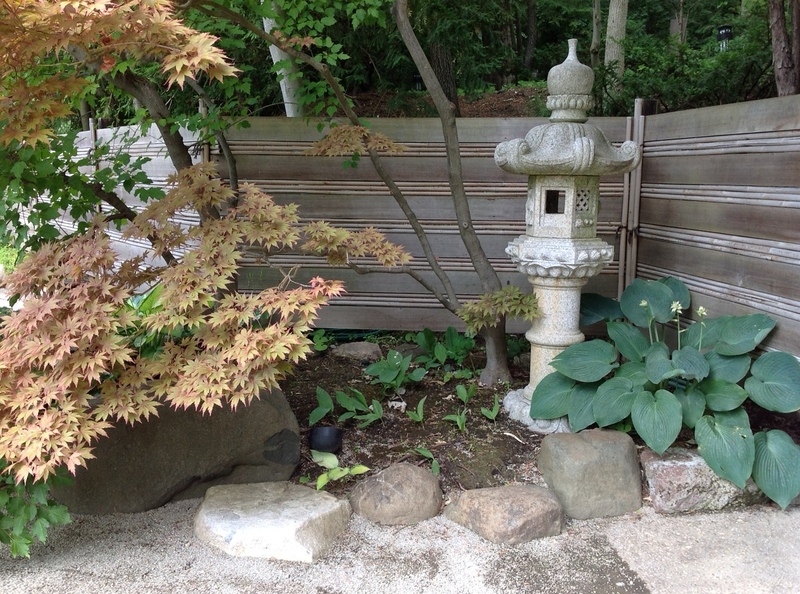 One person glad for the continuing education in Japanese garden design is Tim Gruner, curator of the Anderson Japanese Gardens for the past 25 years. Gruner is a 1987 graduate of the Kishwaukee College Horticulture program. 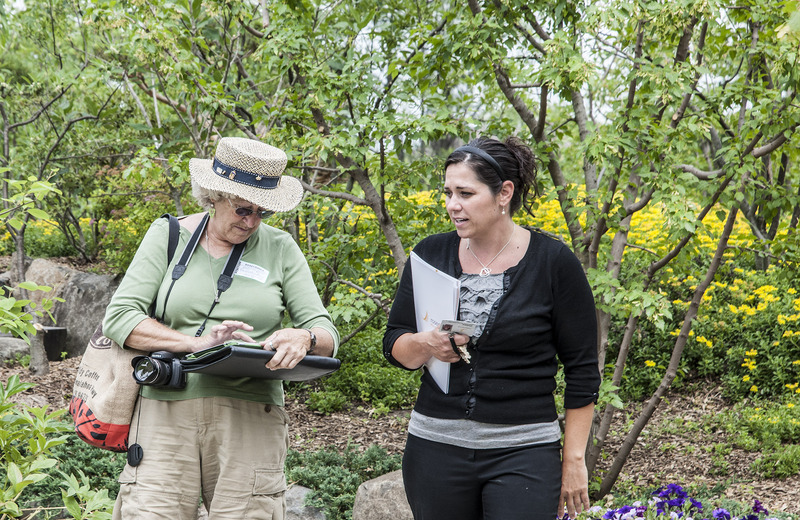 His early interest in public gardens included working at Kishwaukee College’s AAS Trial Gardens and a one year internship at Chicago Botanic Garden. He also volunteered for nine weeks at the Robert and Catherine Wilson Tropical Botanical Gardens in Costa Rica. An in-demand speaker on the subject, Gruner brings warmth and humor along with his encyclopedic knowledge. 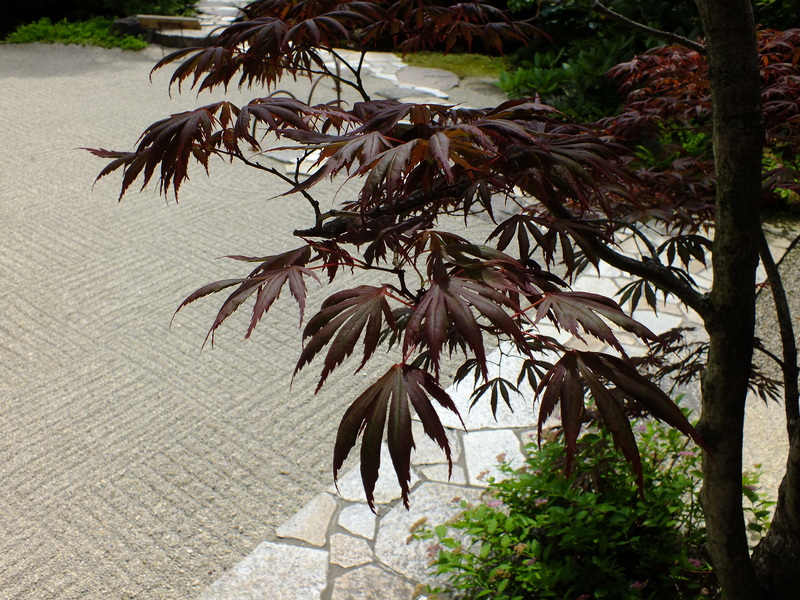 This spring, he gave a photo-illustrated lecture “Patterns and Rhythms in Nature that Inspire Japanese Gardens and the Connection between Garden and Architecture” in which he illustrated Kurisu’s genius for integrating the geometric, man-made lines of structures and pathways with the asymmetrical, curving, organic forms most often found in nature. There is a restful green palette. There is an appeal to all senses: the sound of water falling or flowing, the crunch of gravel on the path underfoot, the clack of bamboo moving in a wind. Such a garden also acknowledges that nature is ever-changing with the seasons and years. 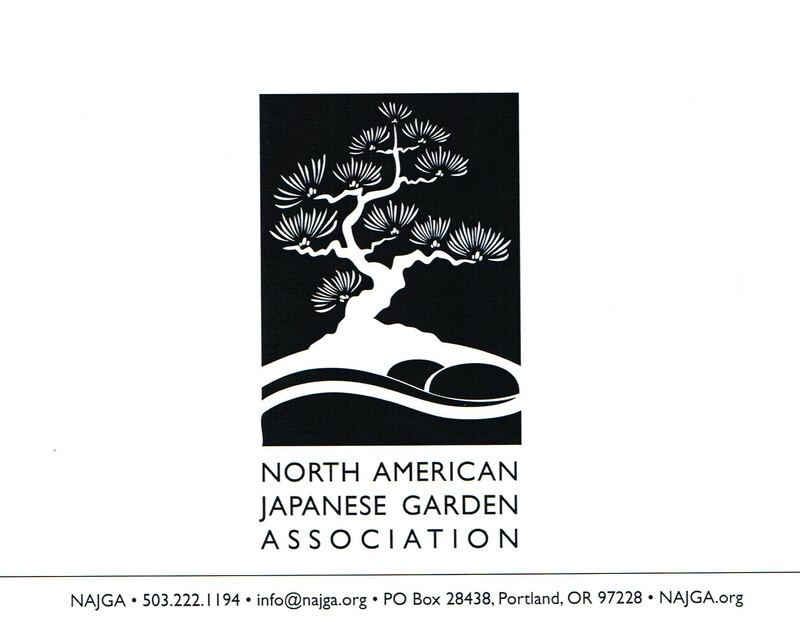 Recently, Gruner wrote about Anderson Japanese Gardens for the North American Japanese Garden Association (NAJGA). 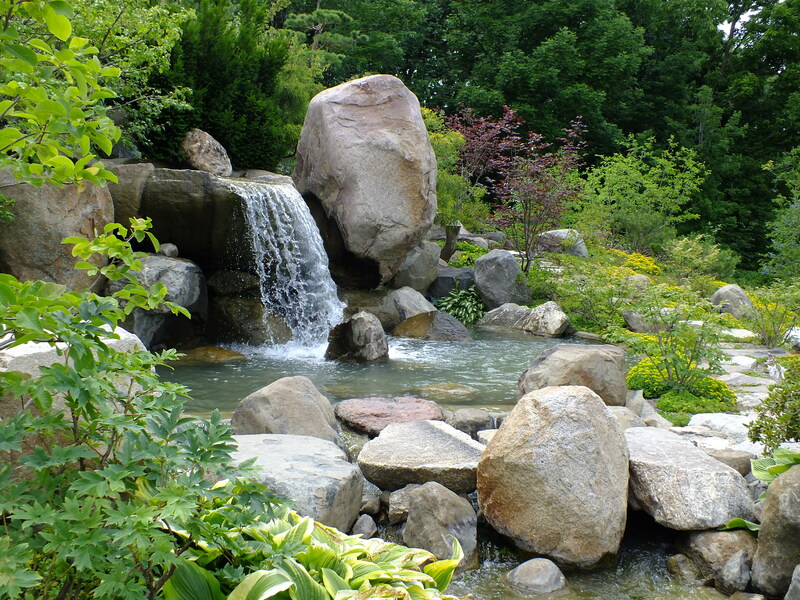 “Much of what guides Japanese garden design is derived from patterns and rhythms found in nature; the general pattern formed by trees growing along streams and on slopes, the nature of a stream cascading down a mountain or winding through a gentle meadow, the gradual transition of the seasons marked by ephemeral blooms,” Gruner wrote. 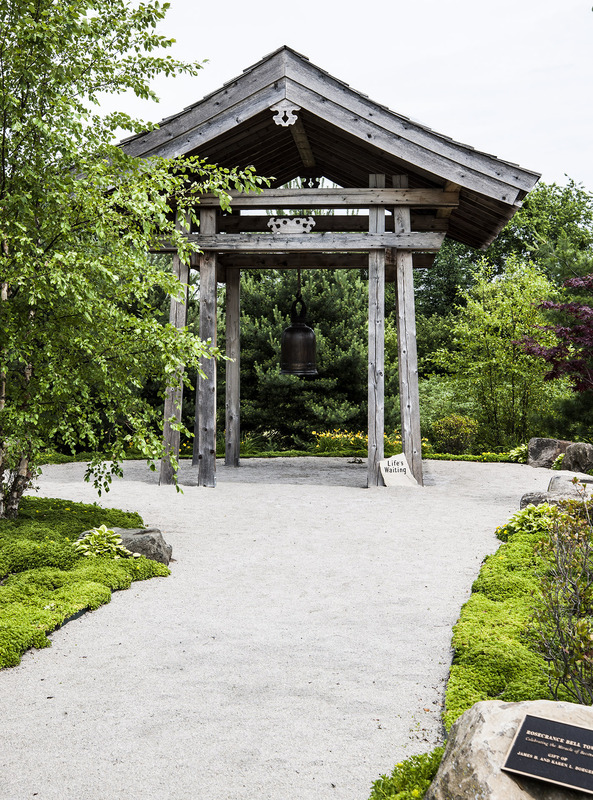 “At their best, Japanese gardens can induce a positive emotional response felt by the human viewer that one might experience in a place of natural beauty. A sense of peace, calm, tranquility, an opportunity for fresh clear thought, awe of nature’s creativity and its ability to rejuvenate are some of the things that can occur in a garden space that might exist in the middle of a busy city or in one’s own back yard,” Gruner said. “Together nature’s patterns and rhythms are carefully combined with humanity’s architecture to form a Japanese garden. In essence, the garden and its architecture come together to form one space. “While the architecture is geometric in nature, it is composed of natural materials such as clean grained unpainted wood, stucco the color of clay earth, stone under posts and as foundations, and bamboo fences and gates,” Gruner said. Tim Gruner joined the Board of Directors of the North American Japanese Garden Association in 2011. The new pavilion offers a venue for outdoor events. 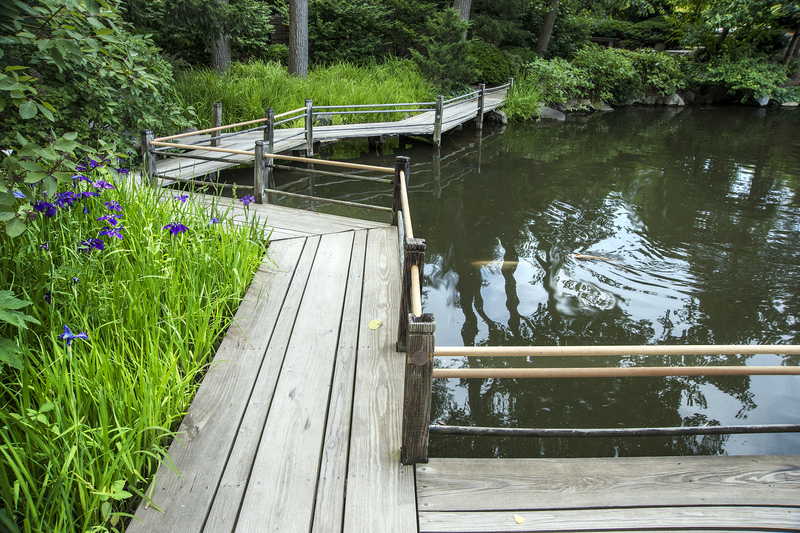 Anderson Japanese Gardens is located 90 miles west of Chicago in Rockford, Illinois. Admission is $8 for adults, $7 for seniors, $6 for students, and free for children 5 years of age and under. The garden’s primary season is May 1 to October 31. 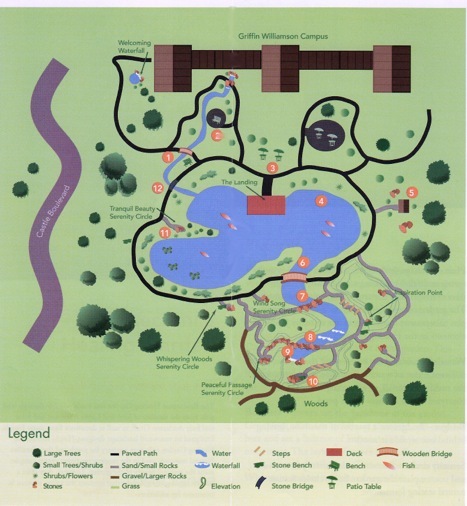 Hours are Monday through Friday 9 a.m. to 6 p.m., Saturday 9 a.m. to 4 p.m. and Sunday 10 a.m. to 4 p.m. For more information and maps, consult the Anderson Japanese Gardens’ web site.